Adding Products: What’s in the Product’s Advanced Tab? Your product's Advanced Tab will contain additional product specific settings which can be configured for the product's specific listing. Below is a listing and summary of the different settings available. Many of these settings work in conjunction with other settings available in different parts of your 3dcart interface. Whenever applicable, we will summarize these other locales within the following descriptions. Category Specific options can be set by going to Products =>Categories and clicking "Options" for any given category. Once you are in the category's option panel, click on "Advanced" to set the category's options. Similar to setting product options on individual products, you can also specify options for all products in a specific category. For example, let's say you're selling jewelry and all the products in your "Necklaces" category come in either silver or gold. Rather than configuring the options onto each and every one of your necklace items individually, you can simply add the option sets to the category and have them apply to the products - as long as they are in that category. Taking this example a step further, let's say you have one particular necklace that is not available in silver and therefore cannot use the category's global options. In this case, you would place a check mark in this box to override the global option sets. Within your global store settings (Settings ->General ->Store Settings) you have the option of sorting your "Home Special" products by newest or oldest on the home page. Also available within the store settings is the option to display your newest items along the left banner of your site under the heading of "New Releases." You can specify the "age" of your products for these two functions, by using the Date Available feature here. Here you can specify the product listing template that is used to display the item. 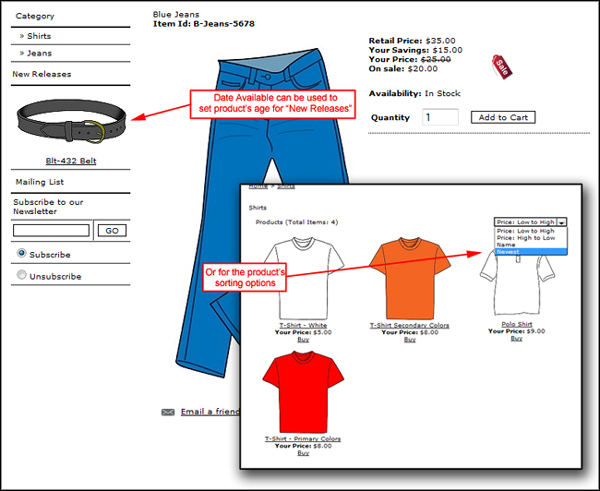 Each of your products is assigned a default display template (listing_0.html) upon its creation that controls the way the item is laid out on the listing page. You can add your own listing templates to your Theme folder in order to have additional listing Styles by uploading your own listing_#.html files to the theme folder. 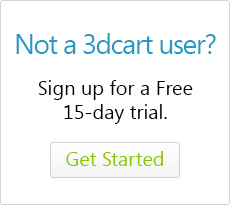 For the login requirements listed above, a customer needs to first log into their account in order to view the product or its pricing information. By default, if the customer is not logged in at the time, they will be directed to the account login pages. However, you may want to direct them to a different page altogether. For example, you may want to take them to a page explaining why they are being asked to log in to view/buy the product. If this is the case, then you would use the "Redirect To" option here to specify where they will be taken. As explained in the Tax article, you can set different tax rates on individual products depending on local laws. For example, in some areas clothing may require a certain tax amount while food items require a different tax altogether. When this applies, you can specify your applicable tax codes here in the individual product's Advanced Tab. Here you can specify what is shown for the product's price - in case it needs to be different than the actual dollar amount specified in the product's Information Tab. Min. Qty. : Allows you to specify the minimum amount of product a customer must order before they can add the product to their cart. This is useful for when you need to sell a minimum amount of product in order to make a profit or the product itself (while priced individually) is only available in sets. Max. Qty. : This setting allows you to specify the maximum amount of products you want to allow customers to purchase at one time. In order to purchase more than this quantity, the customer would need to first check out their current cart, and shop again to buy more. This is useful for when you want to limit the amount of product a customer purchases from you and allows you to have enough product for all customers. Allow fractional qty: This option allows you to let you shoppers select fractional quantities of the product rather than whole numbers. For example fabric lengths or measures which can be bought in specific size measures. More information on this function can be found here. 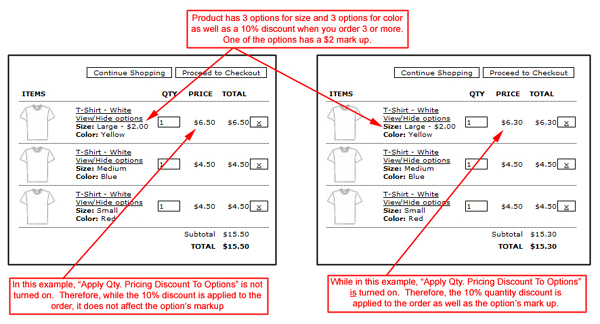 When using Quantity Discounts, the discount applied is deducted from the product's main price. By default, if the option being selected on the product has any sort of mark-up attached to its price, the quantity discount will not apply to it. By selecting this checkbox in the Advanced Tab, the Quantity Discount will be applied to both the product's base price and the option's mark-up value. The option/group pricing functions listed above will only apply to options that are using the drop down, radio button and drop image option types. Text, text area and all other option types will not be applicable to these functions. With Customer Groups you have the ability to assign your customers into different pricing groups. For example, a wholesale customer group with a different pricing structure than your regular retail customers. The Price Levels area of your product's advanced tab is where you will specify the individual product prices for your customer groups. For more details on creating customer groups, please review our Customer Group tutorial download. 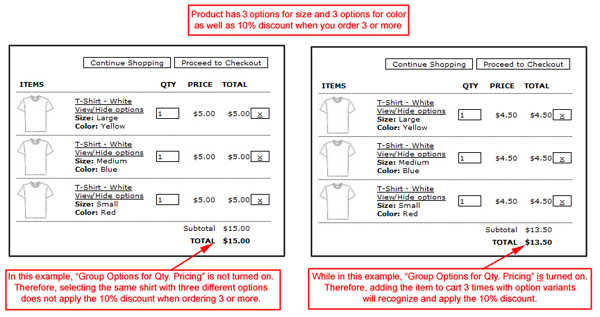 As shown in the above image, you can create up to 10 separate pricing levels for use with your customer groups. You can also use the check box to the right of the pricing level to hide the item from those customers. This can be useful when you want to hide items that are only available to specific groups. For example, you may have an item that is available only to wholesale customers, and you'd like for it to be hidden completely from view to your regular, retail customers. The "Buy Button" can be used in case you have an external site or would like to place a buy now button that links directly to your product. The coding in this section is generated randomly for each product, and will contain the image path for a buy.gif image to be used as your button's graphic. Please note however, that you will still need to upload an actual buy.gif file of your own to use the button correctly. Similar to the buy button, this option allows you to have a link directly to the product. This can be useful when including a link to your product in an email or social network posting. As with the "Buy Button" each product has a link created specifically for it.